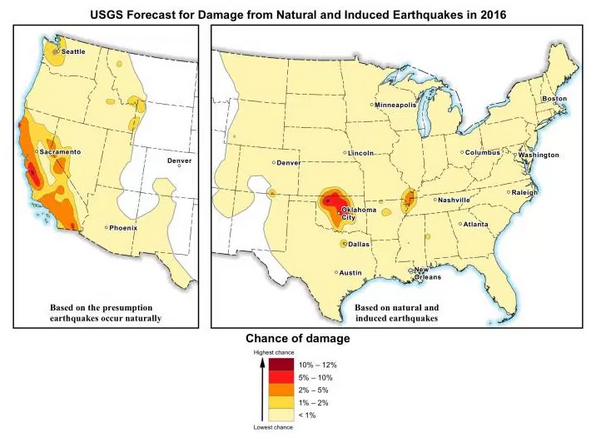 Here is the problem: Now that central Oklahoma is a high risk seismic zone, insurance coverage for quake will be very expensive if only people in the high risk areas purchase it. Currently, the only way to limit those prices will be through regulated premiums, which will reduce the number of insurers willing to write the risk, which will become a vicious cycle. The context offered by Oklahoma Earthquake is enlightening when considering other idiosyncrasies of natural catastrophe insurance in the USA. While governmental oversight of insurance (and all financial industries) is universally accepted for completely valid reasons, there is an aversion to letting insurance function the way it is meant to. Insurance, since its inception over 300 years ago, thrives by spreading the risk across as much of a market as possible. That distribution of risk across high and low risks is the mechanism that makes insurance affordable AND profitable. If it is able to spread risk adequately, regulation needs are minimized. However, cat insurance in this country is concentrated in high risk areas, which is anathema to the fundamentals of insurance. Thus, the way to make insurance for Oklahoma quake affordable is to start bundling quake with standard homeowners policies everywhere. Such a change would require completely different regulations, that would ultimately be easier to administer and adhere to. And the same goes for flood and for wind. It’s not a new idea, but it’s an idea that works elsewhere in the world and which is now supported by the necessary underwriting tools.